So yes, it has been quite some time since I posted here with book reviews so I probably will just write my rating of the books and nothing else unless I really feel the need to share something about it. And because it took me a while to get through some books, I am now 7 books behind my goal of reading 105 books. I’d like to say I’ll be kicking it into high gear, but I probably won’t. Things are just too busy with work and kids and kids activities and birthday parties and housework, etc. etc. etc. However, with that being said, I do want to try to reach my goal – if at the very least, exceed my count of 100 from last year. Wish me luck! I have a moment so I thought I’d write a recap of the past few months. We went to Spokane over the kids spring break – it was a nice time with family. We went to Lake Couer D’Alene for a little bit. We went to parks. And basically hung out with family. My mom was in the hospital for a couple of the days we were there so we saw her there as well. Things are o.k. now. In June, Benjamin and Ella turned 6. We had a combined birthday party with another set of boy/girl twins that were born 2 days after Benjamin and Ella at the Mountlake Terrace Swimming pool – that party was with our Parkwood Elementary friends. That was a lot of fun! We also had one at our house for our non-Parkwood friends. That was a lot of fun as well. The twins finished up kindergarten. I took a picture of them on the last day and compared it to their first day and they certainly have grown! Over the summer, Benjamin will be starting baseball through the YMCA and also taking a soccer class through Shoreline Parks & Rec. Ella is taking swimming lessons at the Y and taking the same soccer class as Benjamin. Nicholas wanted a mom and child swim class but it was already full. Not sure if we’re going to sign him up for anything until he develops more of an interest in things. At this time of this writing, I have an annoying cold that I hope will go away soon as I’ll be heading over to Spokane next Friday for a cousin’s wedding. I can’t wait to see my family! I’ll just be going on my own as they requested that no children come. It’s o.k. – we’ll all be going over to Spokane in August for a family reunion (but on the other side of the family) so they’ll see everyone then! And that’s about it for the time being. How timely that S lands on the day we are travelling to Spokane to visit my family. I took a little rest from posting on my blog. This week will be intermittent with my posts as I’ll be taking the kids to the other side of the state to visit my family while Jon stays home as he doesn’t have enough vacation to come with us. As I write this, my mom is in the hospital. She is fighting cancer and last night she developed a fever and has low red blood cell count so they gave her more blood of which she developed hives from. She hopes to be able to go home tomorrow. I hope so! Don’t you sometimes just want to throw up your arms in the air and say “I quit” in response to seeing yet another idiotic statement. I know I do. I read stupid comments or stories about why gay people shouldn’t be allowed to get married, why we shouldn’t regulate gun purchases, why students are told stupid, non-scientific statements about birth control, or at any number of conspiracies surrounding the Newtown shootings or stupid jokes about banning bombs or pressure cookers. I can’t tell you how fed up I am at all of this. For marriage equality – and that is what it is, an equality issue – I guess I just don’t get it. How does another couple’s marriage hurt you in any way. Maybe if we promoted more love in this world then we wouldn’t have the violence that we have. This is an equal rights issue. If two consenting adults want to get married, why shouldn’t they be able to? The statement that we shouldn’t redefine marriage bothers me a great deal considering marriage has evolved quite a bit over the centuries. For the gun control issues – I was looking at my Facebook feed today and saw this posted by a family member. First – I feel the need to point out that the misspelled “miss spell” – on purpose or not? Second, someone please tell me what is wrong with background checks? From what I hear, 90% of Americans agree that background checks are acceptable and could potentially stop some incidents from happening. If that even has the slightest potential of being true, shouldn’t we do so? I am so angry with the Senate right now for voting down something that a very clear majority of Americans approve of. After all we have seat belt laws because it can potentially save lives though it doesn’t always. We regulate the food industry so not everyone has food poisoning but sometimes people do We require people to go the speed limit to prevent deaths though people routinely don’t follow that one. I could think of many other examples. The same could be said of background checks. It isn’t perfect but it could help. 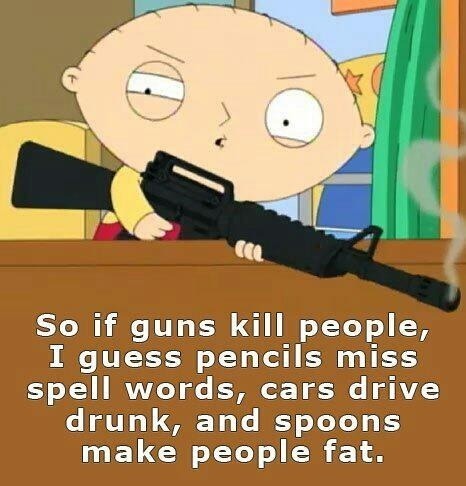 The difference between pencils, cars, spoons versus guns is that the purpose of the first three is not to kill, but to write, drive, and eat respectively. Guns ONLY purpose is to kill. This is why this whole guns don’t kill people, people do argument drives me crazy. And the joke that pressure cookers will need a permit or that bombs will be banned (as I’ve seen another say) is aggravating. The government does regulate explosives. Just like the above, it may not stop everything but that doesn’t mean we shouldn’t have those regulations. For the students that were told that if you use birth control that your parents hate you. I am just speechless on that news story. And finally, my thoughts and prayers are sent out to the people of West, Texas who suffered a horrible tragedy on Wednesday. This plant had some violations recently too. Something I need a lot more of sometimes. I have a feeling my patience will be tested as I drive to Spokane and spend the week there with the 3 kids all on my own, but I am very much looking forward to spending the week with my kids and with my family. I can’t wait until Friday afternoon for my vacation! As predicted, I am a bit behind in my posts. I thought I would put these posts together as they go together in my head. We have all heard the horrible news about the bombings in Boston at the Boston Marathon. My first reaction was – who does something like this? Why would someone think this was an answer to their problems? Then I heard about the death of an 8-year-old. All of the deaths are horrible, but it just hurts that much more when a child is killed. What did any of those people there do to you? I never get that. The people were there for a celebratory event – they didn’t do anything to provoke this type of hatred. The N is Not Again because please not again do we have to deal with this type of event. I remember the morning of 9/11 clearly. I remember hearing about the Newtown shootings all too clearly – in fact, that event is always on my mind with my twins being around the same age as the children that were killed so maliciously. I don’t know anybody personally that were hurt doing any of these events but I feel them deeply and I hurt for those who lost someone. I hurt for the children as the moment they left this earth had to be the scariest moment of their lives – of anyone’s lives really. I cannot possibly imagine what it is like to lose a child. I hope I never have to find that out. I don’t understand this world. Sure, I get annoyed at drivers and politicians and co-workers and friends and family members and any number of things, but I certainly wouldn’t do anything purposefully to harm another. No matter how much I may disagree with them. Then we come to “O” for Outlandish. First, I hear the question asked of Governor Patrick of MA at the news conference the other day asking “Why were the loudspeakers telling people in the audience to be calm moments before the bombs went off? Is this another false flag staged attack to take our civil liberties and promote homeland security while sticking their hands down our pants on the streets?” Wow, really? I don’t get people. Even if the government wanted to take our civil liberties away, I don’t believe for a second that they would kill and maim innocent people just for showing up to a race. People are certainly crazy as evidenced by people sharing conspiracy videos and pictures on Facebook showing the principal of the Newtown school also being killed in Boston (instead of it being human error, it’s a conspiracy!) or videos showing Facebook pages set up before the event offering thoughts and prayers to the victims. I believe on Snopes somewhere they addressed this very issue after the Newtown massacre. People can manipulate dates on things easily. Second, I hear the statement/joke about “oh, we better ban bombs now. oh wait” as a comeback from the people who think the government want to ban guns. The government doesn’t want to ban guns – maybe assault rifles because who seriously needs one of those – but that’s all. They want to be able to regulate the gun laws already on the books that the NRA had somehow got politicians to add items to other bills to make it difficult to do so and they want background checks. What is wrong with that? They say that people will continue to be hurt by guns so why bother with any laws, but these laws could potentially prevent some events so shouldn’t we at least try? What is wrong with trying? We tell people to wear their seat belt not because it will save everyone, but because it could potentially save a good number of people. We tell people to drive the speed limit for the same reason. It may not prevent every incident out there, but if it could, I think we should try. Following FTC regulations, I must point out that all novels reviewed on this blog were either purchased, received from my local library, or received from the author or publisher for review. All reviews of novels will mention where I got the novel from. All reviews are my honest opinion about the novel and are not influenced by how I got the novel. The layout, images, reviews, interviews and other content on this blog are not to be redistributed without written permission.